Muralist Penny Erlich has whisked her exquisite brushstrokes following her passion to enhance and grace the furniture and walls of children's rooms and nurseries across the continent. Magazines, newspapers, celebrities, and national publications have responded with critical acclaim for her exceptional ability to fashion soothing and inspiring art-filled environments for children of all ages. Wendy Bellissimo, the internationally famous interior designer, formed a lasting friendship and association with Penny starting with a chance meeting in a boutique where Wendy's items were sold. Penny was up on a ladder, doing what she does best -- painting a beautiful mural -- when Wendy inquired if Penny also painted murals for children's rooms. 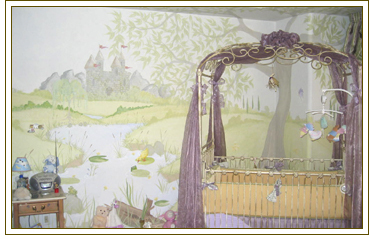 Wendy was pregnant with her first child, Gracie, at the time, and was looking for a muralist to put the finishing touches to the room prepared for her soon-to-arrive daughter. Penny and Wendy could scarcely imagine the magnificent partnership that was being launched from such a humble first project. Penny's work is an integral aspect of Wendy Bellissimo's nursery designs, and a beloved aspect of every client's nursery. Such is the case for Penny's client, Kelly Ripa, whose Bellissimo-designed nursery, based upon the Sir Leapsalot theme, focused the mural design on a specific theme and incorporation of design elements only Penny could produce. Penny's masterful touch enhances the environment of the nursery with fanciful landscapes of castles, green pastures, trees, and, of course, a pond, where rocks conceal the imaginary Sir Leapsalot. While Denver is Penny's primary residence, she spends significant amounts of time in close collaboration with Wendy Bellissimo and maintains a Manhattan Beach extension office. Penny feels a close affinity to both the mountains and the sea which is reflected in many of her commissioned works. "Penny has turned my daughter's nursery into a magical wonderland. She added so many soft and subtle touches to the mural that it promoted a nurturing and comforting environment for my baby. Juliana loves to point to all the animals in the murals. She really enjoys being in the space. My five year old, Gabrielle, adores the fairytale princesses in the vignettes. Overall, Penny's work is exceptional and quite distinctive. She has great vision	and is very friendly and easy to work with." 15 nationally published magazines ranging from ePregnancy to Rosie have featured Penny's and Wendy's collaborative efforts, occasionally even spanning two consecutive issues. Publications and magazine reading consumers can't find their fill of the harmonious mix of Wendy Bellissimo's designs matched with Penny's nursery-enveloping murals. Penny's artwork was most recently honored when featured on every page of Wendy's new hardbound coffee table book, Nesting. Penny would enjoy offering a personalized consultation on how she can use her expressive talents to create a luxurious mural for your child's rooms. Contact Penny via phone, or her online contact form available here.